"The Van Buren Boys" is the 148th episode of the hit sitcom Seinfeld, and name of a New York street gang. Their sign is crossing the hands, with one hand with all the fingers 'up' and spread out. The other hand has all but the thumb and pointer finger up, for a total of eight (8). The gang is named for the 8th President of the United States, Martin Van Buren. This was the 14th episode for the 8th season. It aired on February 6, 1997. Jerry's girlfriend, Ellen (Christine Taylor) seems perfect in every way, but Jerry notices that she doesn't seem to have any friends and becomes alarmed that he's dating a loser. George interviews candidates for "The Foundation's" first scholarship. The candidates seem over-qualified, until one comes in who is a lot like he was. Elaine is going to ghostwrite Peterman's autobiography. Kramer goes to Lorenzo's pizza, where he has an encounter with the Van Buren Boys. He accidentally flashes their gang sign (the number 8, as Martin Van Buren was the eighth president) and saves himself. Meanwhile, Peterman wants his day-to-day life covered in his bio; the exotic adventures are for the catalog. His day-to-day life is very boring. Elaine tells Peterman about Kramer's encounter with the gang and he suggests buying the story for his autobiography. George's scholar, Steven Koren, makes a change in his plans that causes George to disqualify him from the scholarship. Steven had been telling people he wanted to be an architect, the very dream George fictitously tells people is his occupation. One day, however, Steven decides he could do better and remarks to George that he'd like to be a city planner. George is outraged that this slacker feels he could do better than an Architect - the coolest job in the free world. However Kramer sells Peterman all of his stories for $750. Elaine is put at his disposal, much to her dismay. To Elaine, Kramer's stories aren't much more interesting, and most make very little sense. George and Kramer perform an intervention on Jerry's relationship with Ellen. Steven joins the Van Buren boys, who apply pressure on George to get the scholarship back. Elaine tells Kramer that he can no longer tell his stories, since they now belong to Peterman. Elaine tries to embellish Kramer's stories, but Peterman finds the rewrites "too cliché and obvious." She tells him the real Kramer story that he finds much more interesting. He tells Kramer (who had actually called to ask for the return of his stories) that he can have his stories back. George tries to save himself from the Van Buren boys, by asking Kramer how he got out of the similar situation. At the time, Kramer couldn't tell George because that story belonged to Peterman. 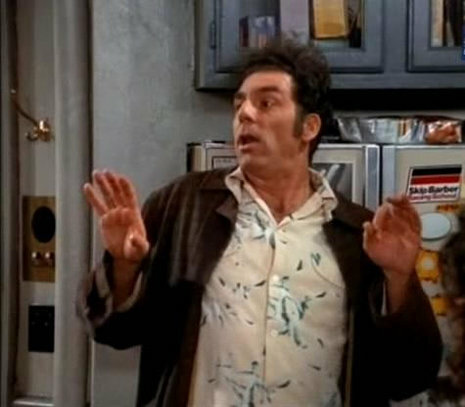 Kramer mentions in passing that "the Van B. Boys" never bother their own kind. Jerry flies his parents in to get their impression of Ellen. Once he sees that his parents both like Ellen very much, begins to see the light; reasoning that if they like her, then there must be something wrong with her. The episode finishes with George trying to prove to the Van Buren Boys that he is a former member of theirs by attempting (and failing) to take the wallet of Jerry's parents as they walk by. The last shot is of him running away from the infamous street gang, after attempting (also in vain) to show them the "sign" (which he doesn't know).